Hi! Well, my blog anniversary was yesterday. But I'm not going to celebrate it until I have 100 public followers. (doesn't include my four private followers. So, if you want to participate, and you are a private follower, I would suggest you become a public follower, as you can only enter the giveaway if you're a public follower) It'll be a two in one blog party. So, there are a few things you can do: Follow me publicly, if you aren't already. Do a blog post on your blog about it (which will give you two entries for the giveaway when it opens) (not a "PS- there's going to be a giveaway at..." kind of post, an actual post solely on/for this topic) Put this button on your blog: That will give you two entries to my giveaway. Or, tell someone specifically about my blog, and if they follow, you can get 5 entries per person you got to follow. You can also sponsor my blog. 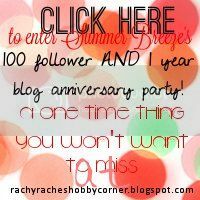 If you have an item you think someone on Summer Breeze will like, email me at rachyspenpals@gmail.com and let me know. If you do sponsor, you can make a button for my sidebar (i will give you dimensions when the time comes) and I will put it up. So, what are you waiting for? I emailed 4 people about your blog: AGMarket, Madeline, Erynn, and Emma Margaret. I hope I get some more people to follow! Grr...I was already your 50th follower, ill do a post about it tomorrow. I'll send it when I get home from work, how's that? thanks sorry if that was harsh, its just if you wanted it ordered yesterday i needed it then, but not i have to wait till september. I'm going to blog about this! I awarded you @ my Blog! Thank you SO much. I feel so honored! I love your blog. I hope you will stop by mine. http://emmavogelsang.blogspot.com/ . It is called Living Fully By Faith. Hi Rachel! I'll sponsor! You could visit my etsy shop: rushingwildflowers.etsy.com and pick anything$5.00 and under (because it is your 100 follower giveaway!) Or I can do a $5.00 giftcard! Email or convo me through etsy!